Sheikh Dawood Ayad Hamza stepped into the world on 1st November, 1968, in Tripoli. Quranic Tajweed was a pure miracle of faith for him and this happened when his father gifted him a recording of the Quran reader “Abdul Basit Abdul Samad” on achieving success in school.Sheikh Dawood was mesmerized with Abdul Samad’s voice and this set the foundation for his determination to learn the nuances of “Tajweed”. 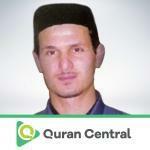 He began by enrolling himself into a Quranic school in which became a medium to get acquainted with several Quran readers like Muhammad Sadiq Al Minshawy. Acknowledging his fresh and prodigious talent, his Sheikhs encouraged him to memorize the holy Quran and to gather hold over the rules of Quran recitation. This was met with success by Shaikh Dawood when he reached twenty years of age. During his preliminary steps, he became one of the famous reciters in Libya and it came as no surprise when he was appointed as an Imam in Canada for more than 10 years. Sheikh Hamza’s efforts to increase awareness and knowledge about the recitation of the Quran saw him visiting many parts of the world, namely, Saudi Arabia, Malaysia, South Africa, Czechoslovakia, and Algeria.